The Egyptian Collection includes nearly 1,500 copper and bronze objects as well as nearly 1,000 gold, 330 silver, 101 electrum, 40 lead, and 209 iron objects. Among these are some of the earliest examples of iron and bronze from ancient Egypt. The types of objects are primarily jewelry, vessels, weapons, tomb equipment, and sculpture. Of particular interest or importance are copper weapons and utensils from Kerma (ca. 2000–1550 B.C. 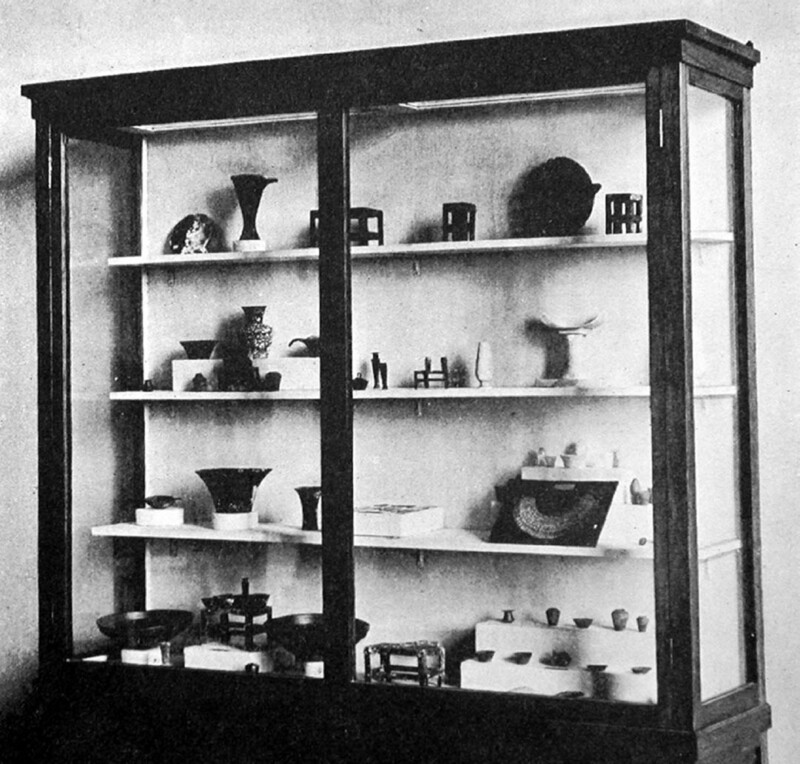 ; Reisner 1923a), a large amount of Nubian silver (Dunham 1955; Gänsicke and Newman 2000), intact sets of jewelry from Meroë (Dunham 1924), and copper vessels (Dunham 1941; Maddin et al. 1984) and gold jewelry from the 6th Dynasty tomb of Impy (Reisner and Smith 1955; Newman 2002). 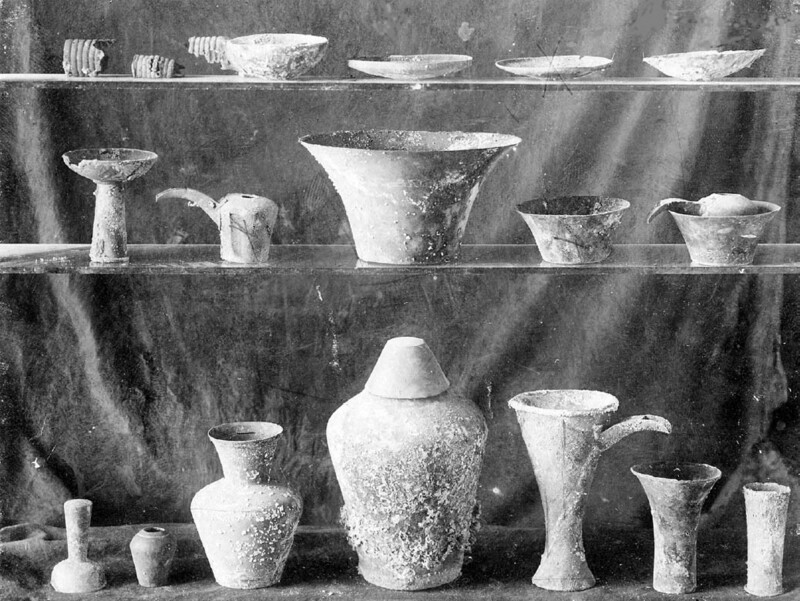 The earliest evidence we have of treatment of metals in the Egyptian collection of the MFA is a group of copper tomb models from the 6th Dynasty tomb of Impy, excavated at Giza in 1912 (figs. 3, 4). These were on display in Boston by 1914, and contemporaneous gallery photographs show the pieces already cleaned (fig. 5). Their current condition—with exposed metallic surfaces, uneven remains of corrosion products, and scratches— suggests that they were cleaned electrolytically or chemically as well as mechanically, but it is not clear if this cleaning was done in Egypt or in Boston. Early publications described the methods in use at the time, both in museums (Rathgen 1905; Lucas 1932) and in the field (Petrie 1904). Mechanical, chemical, and electrolytic methods of cleaning and stabilizing metals were discussed. Historical treatments for copper and bronzes are more thoroughly reviewed in recent conservation literature (Drayman-Weisser 1994; Beale 1996), although less has been written about historical treatments of precious or other metals. It was generally agreed that a stable patina on copper or bronze objects should not be removed, although any tarnish or corrosion on silver was deemed unsightly (Lucas 1932). Whiting (calcium carbonate) in a cream with soap and water was used to polish silver (Lucas 1932). When corrosion was removed, simple methods such as soap and water, brushing, and mechanical means were sometimes used. Mechanical cleaning or scaling was sometimes aided by the use of heat:“heat the bronze over a fire or in melted lead, and then plunge in cold water, which loosens the scale from it” (Petrie 1904, 101), or with an application of glue to the surface, which was allowed to contract and pull up the corrosion (Rathgen 1905). Mechanical cleaning, especially brushing, was likely to follow any further cleaning as well. Chemical methods that were commonly cited for use with metals include acid cleaning (from soaking an object in vinegar for several days, to the application of more concentrated acetic, hydrochloric, sulfuric, or formic acids) to remove copper oxides and burial incrustations; ammonia to remove silver chloride; and potassium cyanide to remove silver chloride and silver or copper sulfide. Often, these chemicals were used with heat and in combination with each other. Lucas (1932) advocated the use of alkaline Rochelle salts (sodium potassium tartarate) for the removal of corrosion from bronzes. Electrochemical treatment using iron or zinc with a weak electrolyte of salt, vinegar, or lemon juice was used on silver (Petrie 1904; Rathgen 1905). Other variations included aluminum with sodium carbonate for cleaning tarnished silver, and zinc with caustic soda (sodium hydroxide) for silver, copper, or bronze (Lucas 1932). The specific procedure preferred by Rathgen was based on the work of German chemist Adolf Finkener and was used on silver and bronze. The object, as cathode, was attached to platinum wire anodes in a solution of 2% caustic soda, and a direct current was applied. Many variations of this method have been published and are described by Gilberg (1988). Lucas felt that electrolytic methods were useful only in large museum laboratories and instead recommended soaking objects in a solution of sodium sesquicarbonate as a more accessible method for the treatment of bronze disease and one that would not destroy the patina (Lucas 1932). 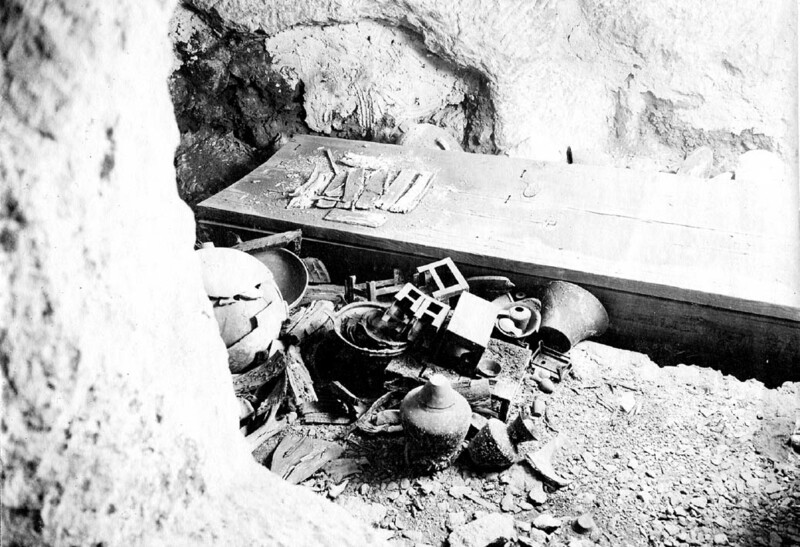 Petrie (1904, 98) wrote, “Metals do not require much treatment in the field.” Perhaps not, but we know that at least some metal objects were treated in Egypt. 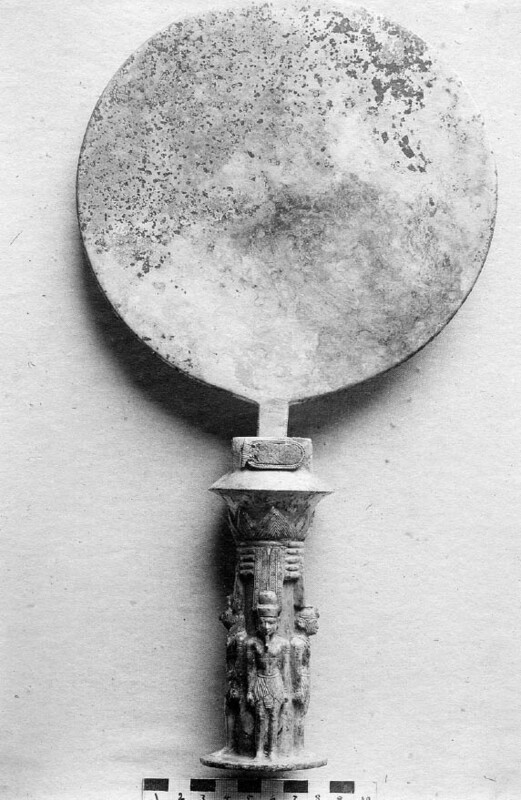 For example, a silver mirror inscribed for King Amani Nataki Lebte and inset with gold and glass was found in 1917 at Nuri (MFA 21.338a–d; Dunham 1955). 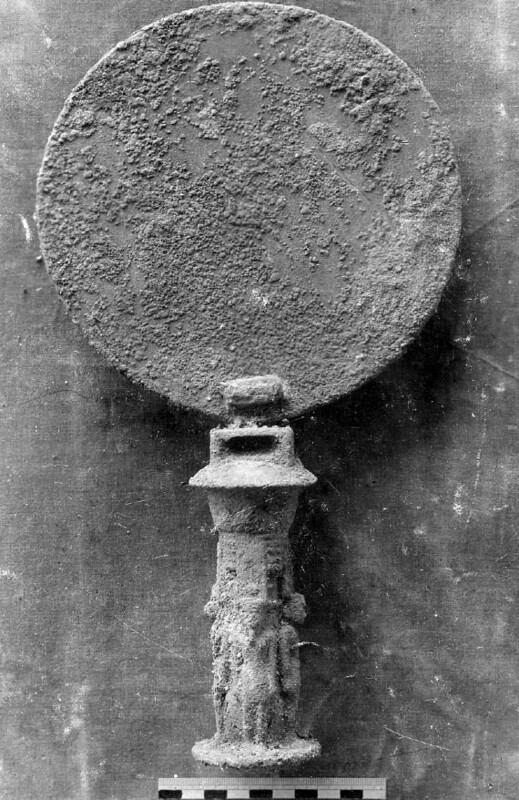 Excavation photographs show the piece with warty corrosion when found and extensively cleaned to bright metal at Giza Camp in 1919 (figs. 6, 7). There are no treatment records, and it is not clear who may have been doing such treatment at Giza at the time. Alfred Lucas is a likely candidate, but there is no evidence of his association with the Harvard Camp until later. Lucas's treatment of one group of metal objects is documented in a typed page describing the analysis and treatment of a group of silver bracelets excavated from the 4th Dynasty tomb of Queen Hetepheres in 1926 (Lucas 1927; Reisner 1927). In describing his treatment, carried out in February and March 1927, Lucas wrote:“After cleaning, the silver was strengthened and protected by coating it repeatedly with a dilute solution of celluloid in amyl acetate. … The cleaning was done by means of formic acid (25 percent solution) followed by ammonia and washing in water” (Lucas 1927). Most of these bracelets ended up in Cairo, with only some fragments coming to the MFA (MFA 47.1699–47.1701). Comparison of the MFA fragments with recent photographs of the pieces in Cairo shows a similar unevenly blackened and slightly pitted surface. Recent Fourier transform infrared reflectometry (FTIR) analysis of the MFA bracelets has confirmed the presence of celluloid. However, the analysis also found evidence of numerous other treatment materials, including rubber cement, a natural resin varnish (e.g., damar), and shellac, suggesting several campaigns of treatment over the years. Lucas used celluloid both as an adhesive and as a coating. Other materials that were used in the coating of metals were paraffin wax, gumdamar, and poppy-seed oil (Rathgen 1905), as well as mastic resin and shellac (Lucas 1932).